This year, Professor Keri Dutkiewitcz will be making the three-week trip in May and it will include a trip to the Great Wall, the Forbidden City and Tiananmen Square. Contact her at 267-5851 or e-mail her at dutkiewk@lcc.edu for more information. Paul Sirmeyer may be the next Indiana Jones if his trip to Beijing and Ulaanbaatar, Mongolia, are any indication. He spent three weeks there last summer going to clubs and spending eight-hour days riding horses in Mongolia with stand-up saddles designed by the great ruler Genghis Khan. We sat down with Paul, who works at the Travelers Club in Okemos in between his college classes, to talk about his experiences in Asia and whether he'd return. Q. What about this trip to Beijing and Ulaanbaatar interested you? A. I'm studying anthropology and art history at Lansing Community College and I had just returned from a trip to London, Paris, and Cardiff, Wales when I spotted a newspaper on the ground at LCC with a story that Professor Keri Dutkiewitcz and six other professors and one student were organizing a trip to set up a student study program. I was really interested in going along. Since then LCC has become one of few community college programs to offer a study program in Mongolia. Q. For someone 19 years old, you've covered a lot of territory. Where do you get your wanderlust? A. Studying different cultures is a passion of mine. I'd really like to be Indiana Jones, traveling around collecting artifacts and art. That would be very cool. My mother is a French woman born in Paris. She was the daughter of an assistant to a sea captain, so they lived all over. She lived in Northern Ireland and Malta before coming to the U.S. and finally ending up in East Lansing - sort of a restless spirit. Q. What was your first impression of that part of the world? A. We landed in Beijing, China, after an 18-hour flight and a lot of whiskey. When I got there I wasn't prepared for it. I thought, "Oh my God, I can't read any of the signs." There was a big language barrier and everything was gigantic, all the buildings and gas stations were huge. There were crowds of people in huge shopping malls that seemed to go on for miles. Q. What was your impression of the Chinese culture? A. There is a battle between traditional and modern China. Consumerism is taking over and there is a big push for Westernization. The traditional Chinese neighborhoods, called hutongs, are disappearing rapidly. They have cobblestones and poor sewage and they are being destroyed to build new buildings. This is emphasizing the large differences between the peasants and the urban dwellers, two very different worlds. Despite the chaotic nature of the city, it was incredibly beautiful and really looked like the Chinese watercolor paintings that show the delicate beauty of the Chinese landscape. Q. What was the attitude toward you as foreign visitors? A. We met kids in China that were our age, a guy named Lu and Chung Lao. Lu took us to clubs and paid our admission and bought us beer - he was 19 and spoke English badly but after we spent a couple days with him, his English got better. We met him in a restaurant with an American girl who was 22 and working in China teaching English since she ran out of money while she was traveling. Q. 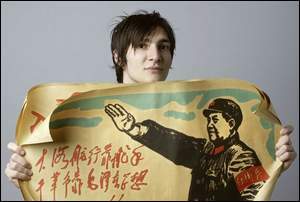 What was the club scene like in Beijing? A. Lu took us to a bar that looked like a dive with dimly lit stairs. That's where we met Chung Lao who didn't speak English but he could communicate with hand gestures. The club turned out to be a jazz bar with open mics and everyone would go up and play jazz while people at the tables were sitting in candlelight. Then Chung Lao brought a guitar over and handed it to me and we sat in a circle with several of his friends and we all jammed with our guitars. There was another club we went to later called "Melt Banana." Q. What about the safety issues that many American's worry about? A. An act against a tourist is considered a crime and taken seriously. A taxi driver took us to the wrong location and demanded that we pay anyway, so I grabbed his ID card and wouldn't give it back to him until he consented to take us to the right club. So he took us and charged what was fair. Q. How was the trip to Mongolia from Beijing? A. We took the train locals refer to as the "Vodka Train" for a 36-hour trip and met a number of nomadic people who raise sheep and sell cashmere. The train goes on to Russia and becomes the famous Tran-Siberian Railway; the stop after Ulaanbaatar is in Russia. Q. How did you find the people there? A. The people were very shy at first and then when they opened up to you, they were very warm. Professor Kari Dutkiewitcz knew a family of nomads that we stayed with in the Near Gobi desert, which is also called the Gobi Els, which means sand. 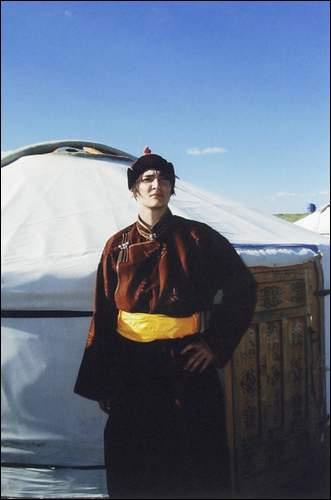 They live in Gurs, which is the Mongolian word for yurt, a round, felt tent. They showed us how they make homemade goat yogurt and hard cheese and we had fermented mare's milk, which was very tasty. We also had lots of homemade vodka. Q. What did you do for recreation out in the dessert? A. We went horseback riding for eight hours at a time. The famous ruler, Genghis Khan (Mongolian Emperor in the 13th century), thought that sitting in a saddle was a sign of laziness, so you stand in the saddle but it is actually a lot easier. The Mongolians are born on their horses and they sleep on horses. They command their horses with a high-pitched whistle and they sing to their horses to calm them and so they will know their master's voice. But the eight hours of riding was exhausting. Q. What was your impression of life in the desert? A. I realized their lives were simple but they were very happy. It was incredible to see them living such simple lives. When I returned home, I realized how much junk I have. Q. Would you go back to Mongolia? A. Yes, it was an incredible country. When you are riding on horseback, the Gobi Desert is behind you and it starts with sand dunes, then it becomes the desert, and then in front are the mountains and you can see about 100 miles; there are condors and eagles, and it is all surrounded by clouds. It's the most beautiful place I have ever seen. Q. Would you go back to Beijing? A. Yes, I plan on going back to teach English next summer.